The spectacular but endangered California Condor is the largest bird in North America. These superb gliders travel widely to feed on carcasses of deer, pigs, cattle, sea lions, whales, and other animals. Pairs nest in caves high on cliff faces. The population fell to just 22 birds in the 1980s, but there are now some 230 free-flying birds in California, Arizona, and Baja California with another 160 in captivity. Lead poisoning remains a severe threat to their long-term prospects. California Condors are the largest wild birds in North America. The wings are exceptionally long and broad, with long primary feathers giving a fingered look to the wingtips. In flight the body is noticeably bulky, the head appears small, and the tail is short and broad. Adults are black with striking white patches under the wings. The naked head and neck are yellowish orange. Immatures have dark heads, grayer necks, and mottled grayish instead of clear white patches under the wings. Adult coloration is reached at 6-8 years of age. Condors are masterful soarers that rarely flap their wings. They have a solid, heavy appearance in the air, and don’t get buffeted by the wind in the way that smaller soaring birds do. Condors are social birds that form groups around carcasses, at bathing spots, and at roosts. California Condors scavenge for carrion in habitats ranging from Pacific beaches to mountain forests and meadows. They nest in caves on cliff faces in mountains up to 6,000 feet in elevation. Their size makes take-off difficult, leading them to use high perches for easier take-offs. Larger than a Bald Eagle; this is the largest bird in North America. How Ventana Wildlife Society got started. I'll never see or hear about the California Condor without remembering our friend and mentor Coverts. Here are the notes from his Condor Class he did for us. I am so grateful that we still have them. What’s in a name? The name “condor” comes from cuntur, which originated from the Inca name for the Andean Condor. Their scientific name, Gymnogyps californianus, comes from the Greek words gymnos, meaning naked, and refers to the head, and gyps meaning vulture; californianus is Latin and refers to the birds’ range. In the late Pleistocene, about 40,000 years ago, California Condors were found throughout North America. At this time, giant mammals roamed the continent, offering condors a reliable food supply. When Lewis and Clark explored the Pacific Northwest in 1805 they found condors there. Until the 1930s, they occurred in the mountains of Baja California. One reason California Condor recovery has been slow is their extremely slow reproduction rate. Female condors lay only one egg per nesting attempt, and they don’t always nest every year. The young depend on their parents for more than 12 months, and take 6-8 years to reach maturity. Condors soar slowly and stably. They average about 30 mph in flight and can get up to over 40 mph. They take about 16 seconds to complete a circle in soaring flight. By comparison, Bald Eagles and Golden Eagles normally circle in 12–14 seconds, and Red-tailed Hawks circle in about 8–10 seconds. At carcasses, California Condors dominate other scavengers. The exception is when a Golden Eagle is present. Although the condor weighs about twice as much as an eagle, the superior talons of the eagle command respect. Condors can survive 1–2 weeks without eating. When they find a carcass they eat their fill, storing up to 3 pounds of meat in their crop (a part of the esophagus) before they leave. 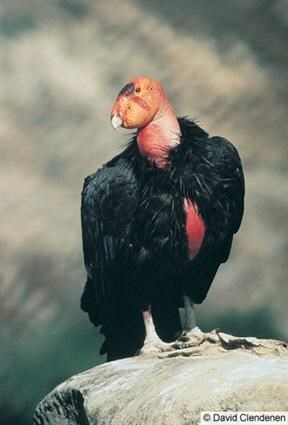 California Condors once foraged on offshore islands, visiting mammal and seabird colonies to eat carrion, eggs and possibly live prey such as nestlings. In cold weather, condors raise their neck feathers to keep warm. In hot weather, condors (and other vultures) urinate onto a leg. As the waste evaporates, it cools off blood circulating in the leg, lowering the whole body temperature. Condors bathe frequently and this helps avoid buildup of wastes on the legs. Adult condors sometimes temporarily restrain an overenthusiastic nestling by placing a foot on its neck and clamping it to the floor. This forceful approach is also a common way for an adult to remove a nestling’s bill from its throat at the end of a feeding. Young may take months to perfect flight and landings. “Crash” landings have been observed in young four months after their first flight. California Condors can probably live to be 60 or more years old—although none of the condors now alive are older than 40 yet. This was sooooo cool. A Golden Eagle was invited to the Condor house for dinner. The condor sat on the post and watched the eagle eat! How kind!! Thank you for the amazing cam to all involved. have to get the LEAD out!!! They took it out of everything else.... even made it illegal in this country. But yet it's still in the ammo??? Ridiculous!! I really like these funny condors. They act like clowns poking and pushing each other. LOL Here's a new video from today. That first guy looks like he's pretending he's soaring over the mountains... Never had to leave the stump!! It was a surprise again for us to see Golden Eagles at the California Condor food pile. The condor doesn't seem to have a problem letting the GE have a taste first. Watch the Condors display their wings! I'm not sure if they were trying to look big and scary to the GE's or they were just drying off after taking a bath. 1st clip,beautiful wing spread,my turn on lookout post lol. 2nd clip,Golden eagle chases away condors from eating prey. Found this today on Facebook. Discusses lead levels in California Condors. I hope this is the right place to post it. Every time I see these Condors I think of Coverts. He would have loved this site.